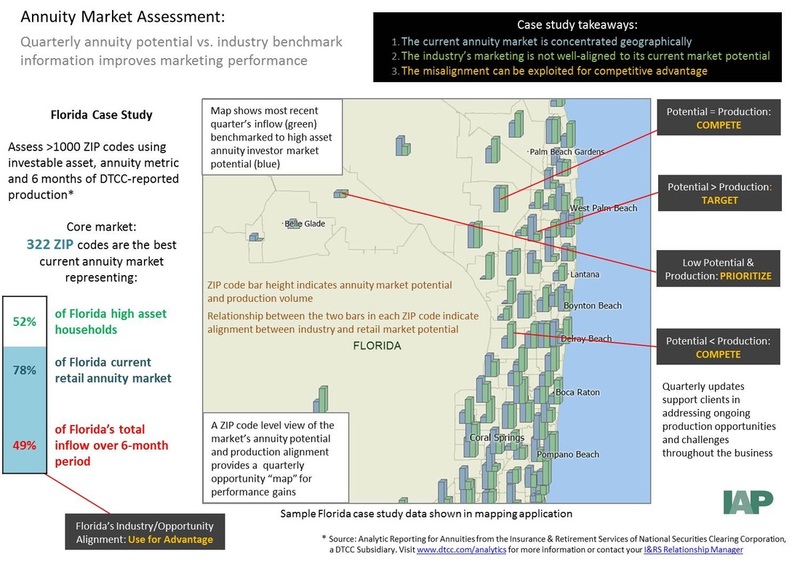 Insurance and wealth management enterprise clients that market through financial intermediaries use IAP's analytics to improve their performance in their local marketing programs. The analytics also serve advisory firm owners and branch managers at the practice level. 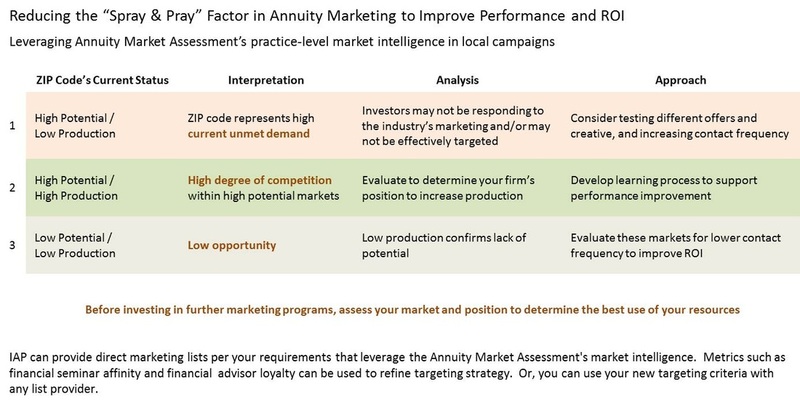 - Where is today's retail annuity potential in my market? - How is the industry capturing this potential in my market? Are my campaigns performing in the most competitive markets? - Which ZIP codes in my market are very unlikely to produce? markets and more frequent prospect touches? The answers to these question will show the scale of retirement income product opportunity in your market and equip you to address the potential more efficiently with campaigns and products. 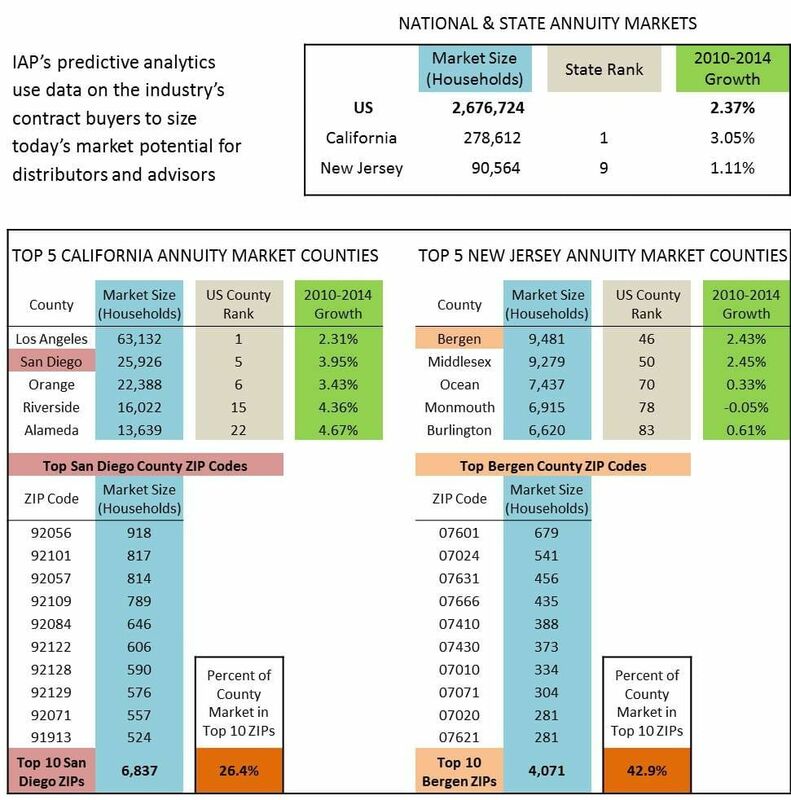 IAP's Annuity Market Assessment will provide your firm with ZIP code-level annuity potential and production intelligence across all competing carriers in your market. You can use our solution's objective information to improve your firm's performance and ROI, and to evaluate new markets. The solution is delivered in Microsoft Excel. Client's define their local market by designating counties or providing a list of ZIP codes. We provide consultation via phone and email to help you evaluate the information, and consider how it can be used in your practice and your upcoming campaigns. The cost is $799. If you are evaluating new markets or practices for acquisition, our market intelligence will provide annuity potential and competitive information, unavailable through any other source, that will improve the search and screening process, and support you in any transaction or launch.